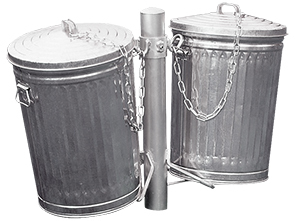 Discourage littering with the ruggedly simple 30 gallon galvanized trash receptacle. Designed with a classic look utilizing commercial grade steel, this economical trash receptacle is a built to last solution for waste management in any application. The versatile receptacle can be used as a standalone unit, single or double side mounted to a 3-1/2"O.D. steel post. The ultra-durable round post features a 4"O.D. adjustable collar and 1/2" steel bars to hold the containers. For added support and security, the lid comes standard with galvanized chain to ensure it stays with the receptacle.